00:00 Sharon: I just realized this is our first interview without Anthony. 00:04 SHARON: Where is Anthony and why are the listeners not getting an update from him? 00:08 Dan: First off, you’re not missing anything with him not being here. Secondly, Anthony has moved to Phoenix, him and his lovely girlfriend, they relocated down there. 00:20 Dan: We’re sorry. I don’t know what else to say. 00:22 SHARON: It’s gonna be a 117 tomorrow. 00:25 Dan: Wow, that’s hot. 00:54 SHARON: Yeah, what is your conversion rate on walking into places and asking for money? 01:01 Dan: That’s tough, I would say… Maybe not even into a business, but the thing you hear the most, which I appreciate is people commend you for your work, so they say “Thank you for what you’re doing,” which is great. I really appreciate that and then that’s about it. And then it goes on. So if you had to put a percentage on… I talked to thousands and thousands of people at our events. I don’t know, 5% may be contribute in some fashion, it’s under 5% would be my guess. 01:34 SHARON: From what I hear, that’s pretty good actually. 01:36 Dan: And that is totally made up. So maybe its like 1%, I don’t know but it’s low. 01:43 Dan: [01:43] It’s awkward or uncomfortable the first time you do walk into these places ’cause this is where I go to drink coffee, and drink a beer and have lunch, and as you walk in, you’re like, “Oh hey, by the way, now I need something from you.” And they’re busy, they’re running coffee or doing the dishes, or the manager isn’t there, so it is a little bit awkward that you have to get over. And the good thing is I rarely do get embarrassed, so I could usually just say, “Hi, I’ll come back tomorrow” and smile and walk away, but. 02:15 SHARON: That’s a really good quality to have. 02:17 Dan: I know it is, but I go home and cry every night. So [02:21] yea… but on the surface, I’m smiling. 02:34 Dan: Okay, good. Are they on next episode? ‘Cause I’ll stop back in. 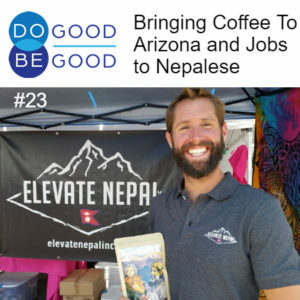 02:43 Dan: Elevate Nepal has started importing Nepalese coffee beans. As far as we can tell, we’re one of the few, if not the only organization or company in America that is importing coffee from Nepal. We’re getting it professionally roasted down in Phoenix, where Phoenix Coffee Roasters is doing our roasting. And we’re selling it in any fashion, wholesale, retail prices, and then this is gonna go to help fund our projects. So it just came in last Thursday, it hit the ground in Phoenix, had it roasted, we went out to San Diego for an event, it did great. I think we sold about 25 pounds over the course of a weekend for our debut. Yeah that’s the biggest thing, that’s it in a nutshell. 03:29 SHARON: Yes, I’m curious now that I’m a business owner, I think all business-y. So, then how do the economics of that work out in terms of what you get from the sale of these coffee beans? 03:42 Dan: So 100% is going back to Elevate Nepal where the funding of the coffee is gonna go right now, it’s just kind of a work in progress. So the business side of it we’re… This is our first shipment, it’s in a bit of a test… Test mode. 04:00 SHARON: Maybe it’s your alpha. 04:32 SHARON: Did You get the idea from something you saw done elsewhere or how did you come up with it? 04:37 Dan: Our first trip to Nepal in 2011, we ended up working on an organic coffee farm, and coffee was being produced in larger quantities then, because there were still more people in the village. A lot of the young people, especially the men have gone abroad or to the cities to seek education or employment. I was there in May at the airport late at night with a friend, his son was going off to Dubai for an internship and I had never seen this before in all my times in and out of Nepal. There’s a specific line that says Nepalese with foreign visa. In this line, at 10 o’clock at night is wrapped around the airport. It’s like you look at it and you’re like, “Oh my goodness, this is… Look at all these kids leaving from 18 to 20 years old, all this workforce and all these resources and these beautiful minds are just now off to go some place else.” And my good friend who’s our coordinator over there, we’re both looking at it and he goes, “Look at all these young people, people going away, it’s crazy.” You know, they figured there’s no opportunity for them. So you see a lot of traditions and cultures dying in Nepal. 05:55 Dan: There’s even villages that we’ve been to, and one of our friends is helping trying to restore is they’re like ghost towns. The homes are abandoned, the jungles are overtaking the small villages. It’s like, this is a beautiful plot of land. It’s very fertile. You can see all the high mountains, the Himalayas. You’re like, “Why would anybody abandon this place?” It’s because there’s nobody there to work the fields. And they say there’s no opportunity. So, a lot of these young people will go to the Middle East to seek employment and they’re not making much. I mean 100, 300 bucks a month, very low wages. So our idea behind it is to give them an opportunity, give them a cash crop, teach them an agriculture skill such as growing coffee. You can pay them a fair wage. We can export the coffee to America, sell it, and then pay them to look after the harvest. Working in conjunction with our coordinator over in Nepal, now we have a prototype village going now. He planted 4000 coffee trees this spring, and he’s sending two of the women in the village to coffee agriculture school so they can learn about the proper way to grow coffee. So, hopefully within three years, these are gonna produce and have healthy, plentiful, delicious coffee beans. If you can give these people an opportunity like that, that’s the idea behind our coffee, which we have branded Sapana Coffee. And in Nepali, sapana means dream. So you’re making a dream come true by purchasing the coffee. 07:33 SHARON: So, what is it about the way that you can distribute the coffee that will allow for more of a fair wage and to be able to bring those jobs back? 07:42 Dan: Just to be able to pay them and pay them their fair livable wage. 07:48 SHARON: Was it like the coffee farm that you worked on, was it a different market that they were selling those coffee beans to that dried up? 07:57 SHARON: Or, he wasn’t able to pay the workers enough for them to stick around ’cause he didn’t have the market? 08:03 Dan: It’s probably… It’s mostly lack of labor. Our coffee is coming from the source who’s like the wholesaler. And he purchases it from the farmers, and we do visit quite a few of these farms. But, like, one in particular, the one farm we’ve been going to for years and years, he still has the land and capacity to grow probably three or five times the amount of coffee he can produce, you know, that’s allowable on the land, he just has no help. He’s 67. His kids have grown. One’s in New Zealand, one’s in the neighboring city, so they really need labor. It’s a funny shift in Nepal right now, like urbanization is really taking off. The young people are moving to the cities, but they’re still not making that great money. You know, working in a hotel in Kathmandu, you might make 50 or 100 bucks a month. You could easily make that in the village growing coffee if not two to three times that amount and stay with your family and keep your traditions alive. 09:06 SHARON: So, you said the root cause seems to be a labor shortage and there’s this sort of thing that has happened so many places where something happens, and so then people go looking for work elsewhere and it’s more… Work is more easily accessible in the cities, but like you said it’s those low-wage jobs in hospitality, tourism, so then it’s not sustainable. And then they’re separating families, and you’ve got… That’s really breaking down the family structure and the traditions and all of that and we’ve see that play out lots of places. So, that’s where I’m trying to get to. What is it in your model that allows it to break that cycle and allows you to… Like, who’s gonna work the fields that your coffee will come from? Are you bringing those people back from the cities? Or, are you putting women who are still in the villages to work in the fields? 10:00 Dan: I think it’s inspiring those young people to stay. 10:05 Dan: Trying to educate them, which this is a very difficult point. Which this is something I’ve been working on really hard the past year and asking a lot of Nepalese people, it’s like, “How do you inspire the young people to stay in the village and tell them that this is the good quality of life, moving to the polluted cities and working for $50 a month is not it. You can make $200 by staying here with your family and living in a cleaner environment and doing something very fulfilling. How do you capture them and inspire them to stay?” I guess I don’t have an answer to that yet. That’s something that we’re working on, but it’s something that is very possible. I think when you create an opportunity such as what we’re trying to do, you can inspire people to do that. 10:49 SHARON: Yeah. So, I’m pushing you hard on this. 10:52 Dan: Please keep going. 10:53 SHARON: ‘Cause now we’re on our third conversation, so I feel like we’re digging into the root of it. 10:58 SHARON: I think you’re really committed to trying to figure out, “How do we do something that really gets deeper and has a more lasting change?” We’re not just trying to go in and bring over some stuff so that they don’t freeze at night. We’re trying to actually help them, help themselves in a way that will bring them out of this in a more long-term way,” which is super hard. 11:21 Dan: It’s insane. It’s insane. 11:23 SHARON: And really great. But also gets into systems theory and gets into all of these fascinating complex things about group dynamics and human systems, and all this, which is what I hope we can do more on this show because this is the point that I wanna make, which is helping people is not easy, and it’s often very complicated. And often, you think that you’re connecting the dots. You think you see problem A, and you’re gonna do solution B, and everybody’s gonna be happy, and we’re all gonna ride off into the sunset. 12:01 Dan: With that Kumbaya style. Yeah. 13:37 Dan: Or like you mentioned, what is the actual problem, getting down to the root of it? Okay, now let’s analyze how we can find the solution. 13:52 Dan: Elevate Nepal’s main projects at the moment is rebuilding infrastructure damaged by the earthquake, so still aiding to earthquake victims. And that’s one thing that we look at a lot. It’s like, Okay, what does this village really need? Well, that can be fairly black and white. They need infrastructure, they need homes, they need schools, they need sanitation system. And we always do talk to the community. Like, okay, what is your number one priority, like for instance in Sarsyu, build the school. Okay, that’s what we’re gonna do. But then you look at what we’re doing with the coffee, this is, it’s restoring villages. But it’s also trying to keep some of those traditions and cultures alive like I mentioned. But the main problem there is, as you come in with that outside perspective, it’s hard to say “No, stay here. This is the better life for you.” Talking to an 18-year-old kid who now has access to Facebook and YouTube and all the stuff and wants to go to America and wants to go to Australia, and he wants to get out of this little village, because on the internet that life looks so much more glamorous. So how do you convince them that they have a great quality of life right here, and it’s very important for them to keep those things alive. 15:10 Dan: I think there is part of it where people need to get out and explore and see it themselves, but the hope is that if they do have something to come back to, not just the maybe something that they’ve been dealing with for the past about 20, 30 years, if there is that opportunity, and they get the education to fulfill that you would hope that you could flourish in some regard. 15:34 SHARON: I feel like we’re going through this five whys thought process almost. So, what I’m hearing you saying. 15:41 Dan: Are we talking? Are we on the same wavelength? 15:46 SHARON: What I’m hearing you say is that there’s this natural tendency, perhaps even pervasive around the world for young people to go out, leave their home, explore and see the world a little bit, whether that’s the world two hours away or half a world away. And then what you want them to have and what you would hope everyone has is a feeling of welcome and a feeling of a potential path back home. 16:17 Dan: Yeah. Keeping those young people in the village I see… And as I talk to older Nepalese people is very important to keep those mountain cultures alive. 17:41 SHARON: I was out at a conference recently, and I heard a really great speaker, his name’s Vu Le. He did a great speech, but one thing he talked about is the difference in building a nonprofit versus building a business. And the fact that if you build a business, let’s say that I develop a new product, let’s just say I come up with a new product and I put it out to market and it’s a hit. It’s fantastic. People say that it’s changing their life, it’s amazing, and people are buying more and more of it. Well, that’s awesome because then I have more and more profit to then funnel back into improving the product, to developing additional products that might serve those same people. Awesome. Okay, so then you think about a nonprofit, so you’re serving people in Nepal, but let’s say you start a new program where you’re teaching building skills to local people and turns out that’s huge and everyone’s like, “Oh my gosh, this is amazing. I really want this.” And so you have more and more people coming in to learn about building skills. Well, now you actually have the opposite problem. 18:55 SHARON: You’re having a great impact, but now you have more expenses, you have more stress on your limited resources and you’re getting no additional resources, and in fact, you need to use your limited resources to go out and to go beg for money from people because you have this successful program. 19:16 Dan: It’s true, and we have that problem now dealing with earthquake victims. The amount of work that still needs to be done in a Nepal from the 2015 earthquake is mind-boggling. I always say, If somebody gives me a million dollars today, I’ll have that spent by the end of the week with the amount of work that needs to be done over there and I’ll find another million next week and have it spent. So, speaking to your point, we have that problem. That every time I go there, come to my village, help me. I show you my school. I could have work for the next lifetime in Nepal, but it’s finding those resources to make these things possible. 19:58 SHARON: Yeah, so I think the non-profits are stuck with both having more of a need to be so clear about what it is you’re wanting to do or what will have the most impact because you’re just gonna get more and more stress on those resources that you’ve developed. 20:14 SHARON: And then I think that is the promise of something like a social enterprise where it’s like, okay, at least one part of your organization benefits when more happens with it. 20:24 SHARON: The coffee goes gangbusters, thank goodness. 20:27 SHARON: Because then at least we can start funneling that into other things. 21:44 Dan: Right, right, exactly. 21:46 SHARON: Instead of I’m selling you this, I don’t know, smartphone. It’s like I’m selling you the idea of a phone that’s gonna do these amazing things and it would be really cool if you wanna come with me to the factory. 22:00 SHARON: And make it yourself. 22:02 SHARON: And give me the money for the supplies. 22:04 SHARON: That’d be great as well. 22:05 Dan: Right, yeah, that’s true, it’s true, yeah. 22:07 SHARON: And I’m not actually knocking that model. I think that’s actually the potential of it, because you’re giving people the opportunity to be part of something amazing. 22:20 SHARON: That you are helping to conceptualize. 22:22 Dan: Yeah. I guess to sum it all up, I wanted to talk about the coffee, which I think we… People have got the good idea behind that. It is gonna be for sale on our website in a couple of days. If not, they can order directly from me. 22:38 SHARON: What’s your website? 22:42 SHARON: And how much will it cost? 22:43 Dan: So, a half pound is $16 and a full pound is $30. So again, the rarity and the source is what reflects the price. 22:53 SHARON: And does that include shipping? 22:55 Dan: It does not, but if you buy from here, us locally in Flagstaff, I’ll deliver it right to your house, and that’s free shipping and you get to see me. 23:03 SHARON: I would just say that’s worth 16.99 right there. 23:05 Dan: There you go, there you go. Well, 16 flat. 23:07 SHARON: Oh. That’s a steal. 23:10 Dan: So you can keep that 99 cents. 23:11 SHARON: That’s a steal. 23:12 Dan: You can keep that 99 cents. Great podcast! Informative, fun and educative. I loved the line of questioning. Thanks!